The New York Upstate Chapter of the American Society of Landscape Architects, in an effort to encourage the participation by and recognition of landscape architects, and to better familiarize the public with their activities and projects, announces the Annual Awards Program for 2017. The program recognizes a full spectrum of innovative projects and efforts executed by individuals, firms, agencies, and academic institutions. More information online. As a reminder, all awards will be announced and presented at the Annual Celebration and Awards Reception scheduled for February 9 in Ithaca New York. Your entry fee will include one ticket to the Annual Award Banquet. 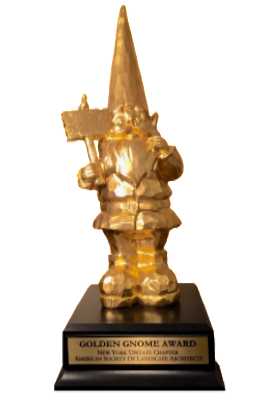 In addition to the six award categories, attendees will participate and select the Golden Gnome award at the reception. This is the Chapter’s 3rd Annual People’s Choice Award.